This Anchor Hocking Oneida 81629AHG17 4 Qt. oven- safe, glass mixing bowl from Anchor Hocking Oneida is perfect for whipping up cookies, brownies, or any other confection you want. This is my 'go-to' bowl when baking because the bottom is flat so when using the hand mixer, I can mix the very bottom and ensure things get mixed properly. They are sturdy and durable--I've had mine for about 4+ years! Can't beat the price! My favorite glass bowl. Looks great on a presentation table and also good for mixing and marinating. Easy to clean and dishwasher safe. Highly recommended. The are good mixing bowl. We have a set that is more rounded, and we wanted something more straight sided to use with our hand mixer. This fit the bill. The largest on is much larger than it looks - we mashed 5 (yes 5) points of potatoes in it all at once. They stack nicely, and take up no more shelf space than a dinner plate. They also hold up in the microwave. This bowl is ideal for large batches. It has the capacity to hold two large batches of waffles (makes about 14 large waffles). It is deep so it's easy to mix all the ingredients. It is a little heavy but it is now my most used bowl. We have some of these in our kitchens. It makes things a whole lot easier for us when we are making our entrees. I definitely recommend that you get this size bowl if you are operating a larger restaurant. 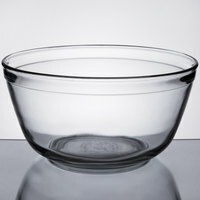 We have about a dozen of these heavy duty glass bowls and use them daily in mixing and storing refrigerated foods. Anchor Hocking is the highest quality. I love the Anchor Hocking products. Made in America is big for me, but besides that, they, while still using soda lime glass, make their products thick. Much like the old school style mason jars, the added thickness really helps both with durability and feel (I prefer the extra weight). I needed this size glass mixing bowl!! I t is the perfect size for mixing up a batch of peanut chews!! best part is it can go in the microwave! These are very durable and thick, easy to clean mixing bowls. We've used them daily to prepare many things at our restaurant. At such an amazing price on top of it all, you must get one. We love these bowls at Creamland. This is a great size bowl for my family of 6. It is nice and heavy and has a wide mouth yet tall sides which makes for easy mixing without spilling. This will be my go to mixing bowl for making batters. It is huge and I like that is it glass and not plastic. Its a great brand name and was happy to find it here. Spacious and durable, this glass mixing bowl is the perfect size for a small batch of dough or anything else that needs mixing. Highly recommend! This glass mixing bowl is great for any baking project! I often use this bowl to hold pizza dough or bread dough while it rises and have not had any issues with it. The glass seems quite sturdy as it has some weight to it and the bowl is easy to clean. I bought this as a parcel of three. These bowls are great. They have good weight and will last a long time with proper care! A great mixing bowl for all uses. The glass is thick and makes it perfect for melting caramels over a saucepan so I can dip apples for our fall festival. The anchor hocking 128oz (4quart) bowl it big and heavy duty! Holds a box cake with plenty of room to mix. I also bought the 2qt and 80oz bowl and they stack nicely. These are good bowls. They are heavy enough for good use but not so heavy that they may be a drop hazard. They seem well made and clean easy too. These glass mixing bowls are wonderful. We use them for everything from ingredients to prep to mixing to serving. We will differently be ordering more as we need them. Great glass mixing bowl! We have a few of them and use them very day. strong and well made. We will get more of them as they come in all different sizes. This is the right size mixing bowl for several things, and I have used this size the most so far after buying several Anchor mixing bowls. Definitely recommend! Really like this bowl - great for melting butter in the microwave and mixing in ingredients. Very substantial in weight, good size and depth for smaller recipes. Very heavy solid 4 qt glass mixing bowl, Nice high sides lets us use our hand mixer and mixes stay in the bowl. We like the anchor products and the price. Nice size and in fact it was much larger than I needed or thought it would be. I may keep it for my cosmetic projects. Nice heavy glass, this size is great all around for restaurant and home use. Very good for displaying ingredients for classes and videos as well. This is the bowl that I pull out whenever I need to double a cake/cookie recipe, since the other sizes are too small. Only downside is that it is a bit on the heavier side. I just love my new 4 Qt mixing bowl, Its just the right size for me to knead the dough and live for rest in the oven! Great, heavy weight mixing bowl. This is a perfect size for mixing cakes and batches of frosting - it's nice and deep without having an overwhelmingly large capacity. The glass is very thick and feels substantial. Anything that makes life in the kitchen easier and more enjoyable is a plus in my book. As much as I love my set of expensive glass bowls, I love these for their high sides, durability and simplicity. Definitely replacing my bowls with these. These bowls are huge. They are quite heavy but they are also durable. As a bonus, Anchor guarantees them quite generously. They are great for mixing doughs or other high-volume foods. They are also oven safe. OMG, I was not sure about this bowl, but when I got them today, I knew I made a great choise, Quite heavy, which I love and just what I needed, hubby says we need more. I've read some reviewers comments about the weight of the bowl. It is pretty hefty but that's a plus for me. I have a set that my mom received as a wedding gift 40 years ago and they are in perfect condition. Bowl is very useful for mixing up things in it, but it is little heavy to carry and hold it. Glass is very thick and sturdy. I love these bowls. They are heavy duty and easy to clean. They are taller and deeper then most glass mixing bowls that I have used and I like that. They also stack well with other bowls by the same company, both in same size or smaller sizes! I absolutely love the variety of uses of this simple, but elegant mixing bowl. I had mainly been using it for mixing cakes and other batters. I also use it as a serving bowl for family get togethers. I just learned that it is oven safe as well and am so excited to use it for keeping my mashed potatoes, dressing and other dishes warm while finishing up the final touches of my holiday cooking. The bowl is very sturdy and I am very pleased to recommend it to you. Good brand, good product! Solid, sturdy & mixes a lot. Also good for presenting large salads and even for a punch bowl for parties. I've even seen it used for making a dome cake. This bowl is so versatile I just bought my second 4 quart bowl. It is perfect for mixing cakes and brownies. The plastic bowl I used to use for mixing would move all around the counter, this bowl stays put for easy mixing. I love this brand. This bowl is very versitile and i own several. Very durably made and can be used in microwave or dish washer. I love these bowls - I bought 4 in order to make baking a lot easier and cut the time in half. They are sturdy, hold a lot and clean well. I was very impressed with the quality of these bowls, especially for the price! You simply cant beat it. They are really heavy, arrived without chips, or cracks, and were unbelievably affordable. I'll be buying many, many more! I needed a large glass mixing bowl and the price on this one was just right. It is a generous size and a hefty weight and I have found so many uses for it. Just love this. Deep and heavy duty it is great for larger mixing. Can also be multi-purpose. And the price is fantastic. Can't be anymore pleased. I think these Anchor Hocking mixing bowls are the most used in my kitchen. They are heavy duty that will last. Very happy with my purchases. This is a great large mixing bowl for making salad dressings and such! Great non reactive material! Very attractive and easy to use as a serving dish too!! These 4 qt. mixing bowls are great for mixing but i even do casseroles in them and they turn out wonderful. I really like these. The Anchor Hocking bowl is a very heavy weight bowl for mixing anything. i like it to make alot of cupcakes at one time. good price! This is a very heavy and well made glass bowl that's size is great for many uses. If you freeze it, it will stay cold while you mix pie crust or anything else needs to stay cold. I also like to put it over a pot of boiling water to melt chocolate. I love this bowl! It's solid and heavy enough so that you can really stirs things up well. But not so heavy that you can't easily maneuver it. I also like that the sides only slope up slightly, which makes it good for using a mixer. e Anchor hocking 4 QTGlass Mixing bowl is great for all your mixing needs. We love the 4 Qt. size mixing bowl for mixing all our cakes, and pastry's it is the perfect size. I just bought this bowl, and it's perfect not just for my baking and mixing needs. It's also great to use as a salad or fruit bowl. The glass makes it easy to wash, and it allows you to see through it while mixing (to see if there are any unmixed portions). I bought 4 Qt Glass Mixing Bowl. It is perfect size. I used it for almost everything from salad to batters. Planning on buying other sizes. Definitely a good buy. It's a great mixing bowl, what else is there to say. This size is great to mix batter in and it comes clean very easily. Nice, big, beautiful bowl. I have the 1 qt and the 2.5 qt bowls, this one rounded out my collection nicely. It fits great in my microwave to soften butter while I'm baking and washes easily.